I am in between 4 books at the moment. I read for the average of 3 minutes in bed and then fall asleep. One book, titled, 'Running is Easy', is by my bed, inspiring, yes, makes getting out of bed at 4.35am that bit easier, but I have gotten into the (bad) habit of reading Joy the Baker in bed. (You can read this book, it is not just a flicking recipe book). Anyhow, I found my new hands-down favourite banana loaf recipe: Chocolate Bourbon Banana Bread (even minus the Bourbon it was great!). Seriously need to stop reading this book and read more about running. In her first cookbook, popular caterer and blogger Joy the Baker brings together a celebration of sugar and butter as she approaches baking with inspiration and heart. Joy the Baker's website is extremely popular as is her Los Angeles based catering company. 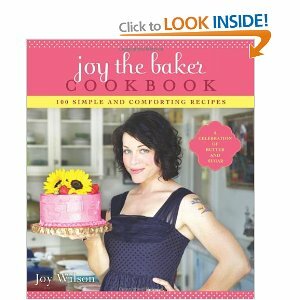 Now in JOY THE BAKER COOKBOOK, she shares her incredibly delicious recipes for all kinds of sweet dishes: pancakes, cupcakes, brownies, cookies and much more. All this is achieved with her usual warm, humorous and irreverent style. Love it-my new favourite recipe book. Totally indulgent recipes that always turn out well. I read Joy's blog, but I still can't wait for her to publish another book! I love this one that much. My favourite recipes are the banana and bourbon loaf and the browned butter cookies. Joy writes little stories among some of her recipes which I love - I also think the photos are great...I always love photos in recipe books. Another thing - all recipes measurements are in American cups. I LOVE this...so much easier than faffing around with scales...and from now on am going to purchase American versions of recipe books. (Lazy...maybe. I haven't even owned a set of scales for 3 years!). Get it. I like this book. My neighbours are also happy with it! I need to read that running book! I LOVE LOVE LOVE running and have an eventual goal of running a marathon but do not have the guts to run over 10km...maybe it will teach me!